The direct testing of samples via antigen-ELISA is considerably faster and cheaper than virus isolation. On the other hand, virus isolation is about ten times as sensitive as the ELISA. False positive results are frequent and must be confirmed by a follow-up test. The antigen-ELISA is mainly useful for tests of entire herds. Samples with suspected virus antigen is adsorbed to a polystyrene surface and tested with enzyme marked antibodies. This test is frequently used in the so-called sandwich procedure. 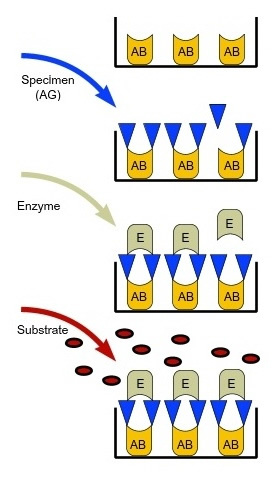 The plastic surface is initially covered with an unmarked antibody (catching antibody), which adsorbs the relevant antigen from a mixture (e.g. leukocyte lysate). In a next step, a BVDV-specific enzyme-marked antibody is added. If antigen is present the antibody will stick to it. After addition of a suitable substrate a colour reaction will take place and the optical density (OD) is determined in a photospectrometer. ELISAs determine the cut-off value with the help of positive or negative sera, which categorizes the animals into positive and into negative. However, there is quite frequently an overlap in the distribution of the test results of known infected and non-infected animals. Therefore, two cut-offs are determined that define a clearly positive and a clearly negative group. The results in between are characterized as indeterminate and tested with a more specific and more sensitive method (e.g. virus isolation in cell culture or PCR).